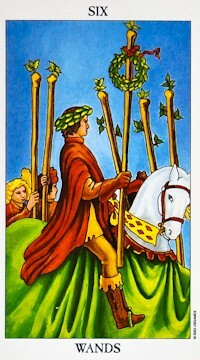 The Six of Wands brings good news, recognition and sometimes, victory! Some sort of struggle, either personal or professional, has been resolved in a very satisfactory way. Others notice you and respect what you have gone through to achieve what you have. 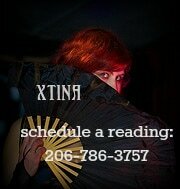 This card is an excellent omen if you are in the arts and often brings a certain amount of fame with it. Now is the time to graciously accept compliments and rest for a bit. You are worth attention and/or payment. Your perseverance pays off. Beware of people who may be jealous of your accomplishments. Some may call you 'lucky', but luck had nothing to do with your success. Reversed: I don't use reverse cards, as every card has inherently positive and challenging aspects, depending on the client and the reading.